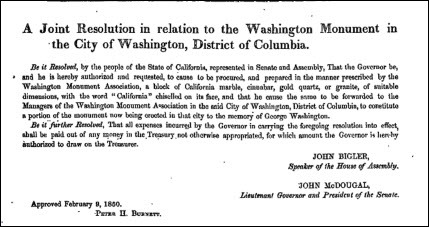 Be it Resolved, by the people of the State of California, represented in Senate and Assembly, That the Governor be, and he is hereby authorized and requested, to cause to be procured, and prepared in the manner prescribed by the Washington Monument Association, a block of California marble, cinnabar, gold quartz, or granite, of suitable dimensions, with the word “California” chiselled on its face, and that he cause the same to be forwarded to the Managers of the Washington Monument Association in the said City of Washington, District of Columbia, to constitute a portion of the monument now being erected in that city to the memory of George Washington. That was just one of 19 separate resolutions adopted by the Legislature in that very first term of the Legislature, from the 15th of December 1849 to the 22nd of April 1850 at the City of Pueblo de San Jose. Still, like other legal enactments, these resolutions can be genealogical gems: putting issues of the day into context (like the desire for a railroad to the Mississippi) and providing details we might not get otherwise (like the daily paycheck of the legislative chaplains). So not just the statutes but even the resolutions… every single word that comes from those legislatures… take a look. Even the explanation for a stone now part of a monument on the other side of the continent. Just because it was resolved.